A sample image of a card purchased in a Dean's Cards sleeve. Buying your baseball cards and other sports cards from Dean’s Cards brings you some special technological benefits that nobody else in the sports card hobby can offer you. 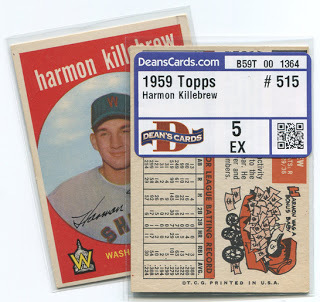 In August 2012, we began to professionally grade and scan all the vintage cards (1952-1969) in our inventory. You can now access ACTUAL IMAGES of any vintage card you purchase from Dean’s Cards by scanning the "QR Code" on the sleeve with a smart phone or tablet. We also plan to add a proprietary card collecting software, so you can organize your collections, and view images and vital statistics of the cards in your collection. Our goal is to bring all the advantages of technology to you to help easily share your cards with others and view your cards easily on your smart device. Before we introduced QR code tracking, we had only the stock images for the vintage sports cards listed online, but now each and every vintage card has been professionally graded and is accompanied by a full front and back scan.And for your high end cards, you can use the actual cards to help insure your collection. As we continue to add more features to the QR scan technology, we will share the news through our website, blog, email newsletter, Facebook, Twitter and YouTube. Our goal at Dean's Cards is to provide you with a simple, cost effective and enjoyable way to build your collections. We’re excited about the technological advancements we have made for you and look forward to continue adding value to your purchases from Dean’s Cards. Advanced Technology for card identification. Dean's Cards has made this investment in advanced technology because we want to take the guesswork out of your purchase. When you buy a vintage card from Dean's Cards, "What you see is what you get!"